Habits are automatic behaviours that allow us to do a lot more than if we had to think about everything we do. Some 70% of what we do is automated in this way. At some time in your career you are likely to have some things about the way you work that you want to change. Understanding how the brain works to change behaviour is a good start in giving yourself the best chance of success in changing work habits. First of all, it’s important to distinguish between your intention to adopt a new habit or achieve a goal, and your plan to do so. Around the first of January every year most of us have very clear intentions, but rather vague plans. And brain science tells us it’s more effective to focus on what you do want rather than what you don’t. According to Hebb’s Law, “neurons that wire together, fire together,” so focusing on breaking the old habit may actually strengthen it. Focusing on creating a new habit forms new neural networks in the brain and gives you the best chance of embedding the behavior as a habit. Neuroscientist who study this have proposed three-stage process for creating, or changing habits. These ideas were used by Business writer Charles Duhigg in his book ‘The Power of Habits.’ The process involves developing a plan that contains a cue, a routine and a reward. Habits are triggered by cues – triggers or signals that tell us to act in a certain way. 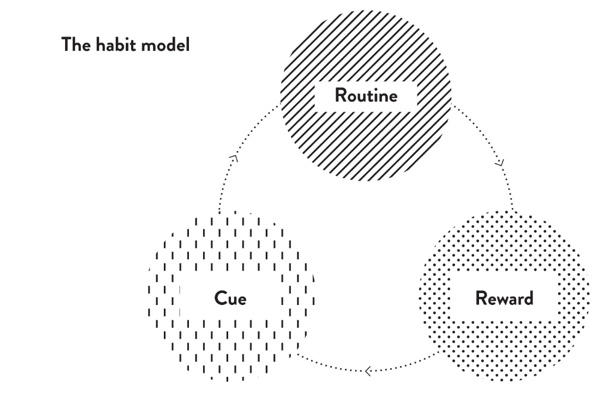 Habits are triggered by cues – triggers or signals that tell us to act in a certain way. To create a new habit, we need to also create a cue: something that tells us to take the next step. Working on the cue will help make or break a habit. For example, if you want to connect more with the team you may decide to spend 10 minutes each morning walking around the office, instead of sitting doing your emails. Your cue might be hanging up your coat: that’s when you start your walk-about. Experiment with different cues until you find the one, or more than one, that works for you. Define the steps you will take: the actions that you are trying to form into the habit. It helps to write down your routine so you know the exact steps. For example, if the routine is to talk to the team informally three times a week, you might block out these times in your diary so that other meetings can’t be put in. The concept of “if-then” planning is built around a routine and helps to plan for issues that might knock you off course. For example, instead of just having the intention, “I will have more informal conversations with the team,” your if-then intention might be: “If I walk around the office at least three mornings a week then I will talk to the team informally.” Studies have shown that this can be very successful in helping to form new habit routines. Rewards need to have some key characteristics; the more the cue also triggers a craving for the reward the more likely you are to be successful in embedding the new behaviour. This is important to embed the new behaviour into a habit. And it’s probably the reason why just repetition doesn’t work. 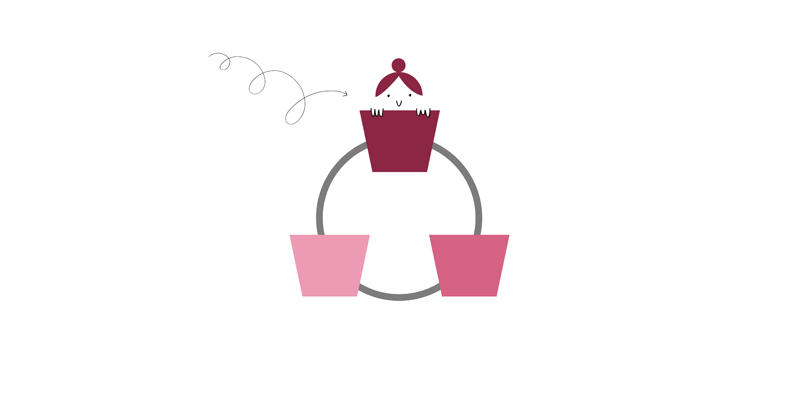 Rewards need to have some key characteristics; the more the cue also triggers a craving for the reward the more likely you are to be successful in embedding the new behaviour. For example, if you are trying to get into the habit of going to the gym, choose a cue such as going as soon as you wake up: get dressed straight into your gym gear. Your reward might be the endorphin rush you’ll feel once you get into it, or a smoothie after your workout. Then think about that smoothie. Allow yourself to anticipate the reward: the anticipation is actually more important to the brain than the reward itself. Rather than trying to make yourself enjoy the routine your aim is to get your brain to crave the reward. Many studies have shown that a cue and a routine on their own aren’t enough for a new habit to last. Only when the brain starts expecting the reward – craving the endorphins, or the smoothie – will it become automatic. Your cue, in addition to triggering your routine, must also trigger a craving for the reward. The reward attached to connecting more with your team might be having a better understanding of what’s going on in the office, and a greater sense of control. Anticipating that sense of control could be what maintains the new routine. If you want to avoid lapses there is one more crucial ingredient: belief. Even with the best intentions, lapses will happen. Who hasn’t started at the gym regularly, then gone on holiday and fallen out of the routine? Or introduced a new way of working only to have it trail off after a month or two when you are under stress? For example, social learning communities can help learners support each other to adopt new behaviours. Groups create accountability and belief, which are crucial in helping you stick with new habits. So if you want to improve your connection with the team ask yourself who can give you encouragement and feedback? If you want to make a habit of going to the gym is there someone who could be your exercise partner every morning? Or could you hire a personal trainer you’ll feel compelled to report your progress to? The more positive reinforcement you can surround yourself with, the easier it will be. New habits, no matter how well-supported, can be very fragile. It’s as well to be prepared for when you relapse. New habits, no matter how well-supported, can be very fragile. It’s as well to be prepared for when you relapse. Dan Ariely calls this The “What-the-Hell” Effect. A habit is a formula our brain automatically follows: when I see a CUE, I will follow the ROUTINE in order to get the REWARD. So now you’re ready to trash the whole new habit plan – it’s obviously not working. Not only do you not go to the gym but you eat chocolate biscuits all day. The solution is to examine your plan and find exactly where things started to go wrong. Look for small things that changed your cue or your routine. Remember, a habit is a formula our brain automatically follows: when I see a CUE, I will follow the ROUTINE in order to get the REWARD. So the message is: have a good plan, make sure there are anticipated rewards that are cued regularly, and don’t beat yourself up, or be too hard on your organisation, if you lapse.